Price : From AUD $ 2236 Per person on twin sharing basis. Arrive Delhi Airport. On arrival meet & greet by our Representative & transferred to booked Hotel. Overnight stay at Hotel. (120 Kms / 04 Hrs drive) Moring on time transfer to the Airport to connect flight AI 409 depart Delhi at 0720 Hrs arrive Patna at 0850 Hrs. On arrival at Patna drive to Bodhgaya, where Lord Buddha attained enlightenment and which is one of the most sacred pilgrimage places for the Buddhist. En-route visit Nalanda and Rajgir. Nalanda-a great center of Buddhist learning and one of the most famed university citadels of ancient times. 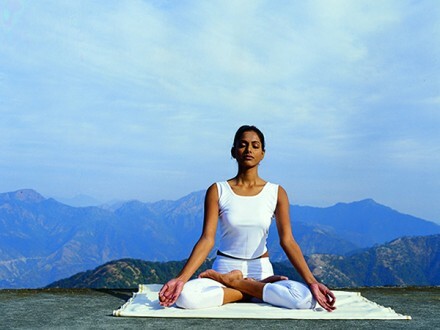 Rajgir was once the ancient capital of the powerful kingdom of Magadha. From the out skirts of Rajgir, a historic road leads to Gridha – Kuta or vultures peak where the Buddha preached, here the first Buddhist Council was held after the Lord’s Mahaparinirvana. On arrival in Bodhgaya, check-in at hotel. Overnight stay at hotel. After breakfast sightseeing of Bodhgaya. Visit Mahabodhi Temple – depicting the various phases of Buddha’s journey towards enlightenment, showing different aspects of his life; Bodhgaya Archaeological Museum – houses a small collection of Buddhist sculpture from the 1st century B.C, to the 11th century A.D; Jagannath Temple close by has a four armed statue of Shiva in black stone. Overnight stay at Hotel. (245 Kms / 07 Hrs drive) After breakfast drive to Varanasi. On arrival transfer to the hotel. Evening visit river Ganga Ghat to attend the Holy Aarti. Overnight stay at hotel. Early morning boat tour on River Ganges to visit Bathing Ghats, return to hotel for breakfast. Later leave for city tour of Varanasi visiting various temples and noted Banaras Hindu University. Afternoon excursion to Sarnath. 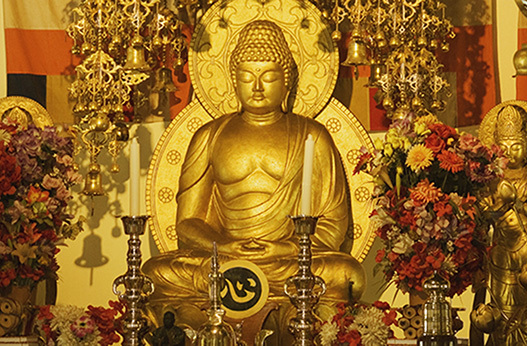 It was here that the Lord Buddha delivered his first sermon and set in motion the wheel of law of Buddhist faith. Overnight stay at hotel. (265 Kms / 07 Hrs drive) After breakfast drive to Kushinagar. On arrival transfer to the hotel. Afternoon visit Mahaparinirvana Temple and Rambhar Stupa. Overnight stay at hotel. (170 Kms / 04 Hrs drive) Morning drive to Lumbini. On arrival transfer to the hotel. 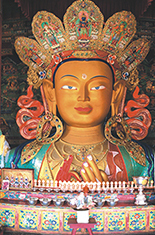 Afternoon enjoy sightseeing tour of Lumbini where the Lord Buddha was born. Visit the pillar raised by Emperor Ashok, in the twenty first years after his coronation at the birthplace. Overnight stay at hotel. (145 Kms / 04 Hrs drive) Morning after breakfast drive to Sravasti. 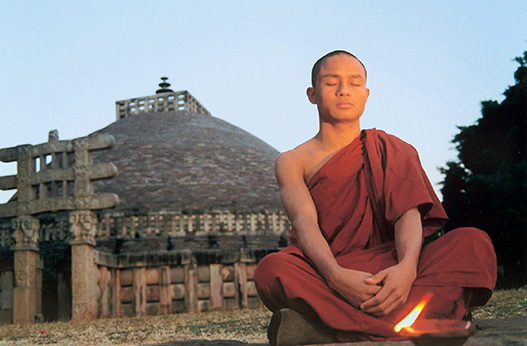 On arrival visit Sravasti (Sahet-Mahet) capital of the ancient kingdom of Kosala, an active centre for Buddhism. Later drive further to Lucknow and directly transfer to the Airport to connect flight AI 812 depart Lucknow at 1800 Hrs arrive Delhi at 1900 Hrs. On arrival, meeting and assistance by our Representative and transfer to the hotel. Overnight stay at hotel. Morning leave for Delhi sightseeing tour which includes drive past Red Fort (Closed on Mondays), Raj Ghat (Cremation site of Mahatma Gandhi). Also visit Qutab Minar, Humayun’s Tomb & India Gate (War Memorial). Also enjoy drive past President House & Parliament House. Overnight stay at Hotel. (203 Kms / 04 Hrs drive) Morning breakfast at Hotel and drive further to Agra. On arrival, check-in at Hotel. 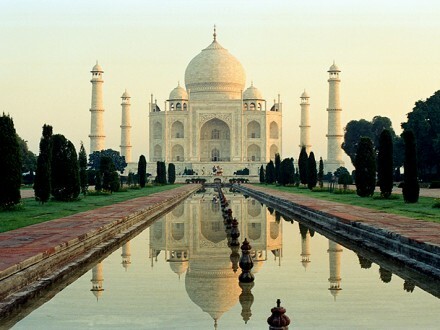 Later visit world famous Taj Mahal, built by Shah Jahan in 1560 in memory of his Queen Mumtaz Mahal to enshrine her mortal remains. This architectural marvel is a perfectly proportioned masterpiece fashioned from white marble that stands testimony to the skill of 20,000 craftsmen brought together from Persia, Turkey, France and Italy and who took 17 years to complete this ‘Love Poem in Marble’. 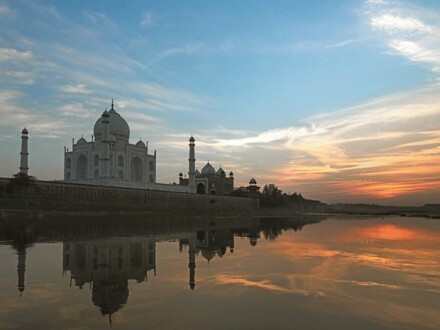 (Taj Mahal remains closed on every Friday) Also visit Agra Fort, with its impressive imperial quarters and marbled apartments. Overnight stay at Hotel. (232 Kms / 05 Hrs drive) Morning breakfast at Hotel. Later drive to Jaipur. Enroute visiting Fatehpur Sikri, which is the old Mughal capital still preserved in good condition. On arrival, check-in at Hotel. Rest of the day free to explore the colourful markets by own. Overnight stay at Hotel. 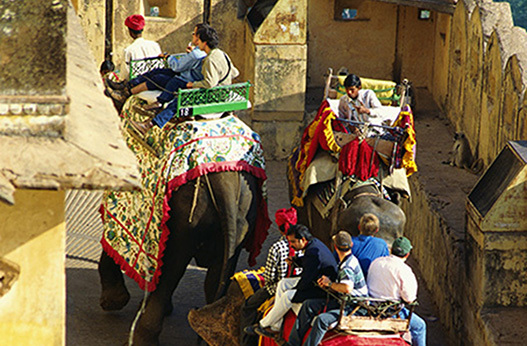 After breakfast, half-day visit to Amer Fort with Elephant ride / Jeep ride (Elephant ride will be subject to availability otherwise Jeep ride will be provided). 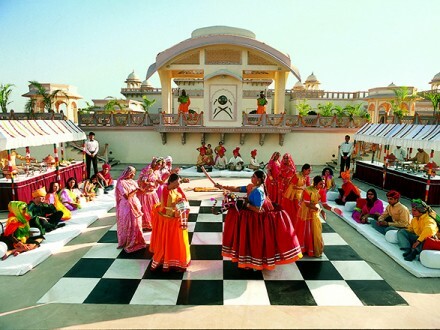 Amber is a classic, romantic Rajasthani Fort Palace. Inside the Fort, visit the Jag Mandir or the Hall of Victory, famed Sheesh Mahal – a room with all the four walls and ceiling completely embedded with glittering mirror pieces, which were specially imported from Belgium during that period. Enroute to Amber Fort, you will have a brief photography stop at Hawa Mahal – the Palace of Winds. After lunch, visit Pink City including Maharaja’s city Palace, the former Royal residence part of it converted into a museum. One of the major attractions in the museum is the portion known as Armory Museum housing an impressive array of weaponry-pistols, blunderbusses, flintlocks, swords, rifles and daggers. Later visit the Jantar Mantar, which is the largest stone and marble crafted observatory in the world. Situated near the gate of the city palace, the observatory has 17 large instruments, many of them still in working condition. Overnight stay at Hotel. (252 Kms / 05 Hrs drive) Morning breakfast at Hotel and after breakfast driver further to Delhi. On arrival in Delhi, directly transfer to the International Airport to connect flight for onward destination.